SYFY talked to me and TMNT writer Tom Waltz about the upcoming issue of Teenage Mutant Ninja Turtles! You can check out the mini interview and exclusive preview pages by following the link. I’m excited to say that our book LUCY DREAMING is coming to stores January 9th! Following you’ll find the book’s synopsis and a few online links! Max Bemis ( Moon Knight writer and lead singer of Say Anything) and Michael Dialynas ( The Woods ) present a vibrant coming-of-age fantasy about living your dreams.literally. In her dreams, Lucy is the hero of all her favorite stories, living each night as a grand adventure. But as fantastic as these dreams h are, they carry the same life-and-death stakes as the waking world, and it up to Lucy to uncover the truth behind her multiversal travels. James and I are very proud to announce that our Boom! Studios series, THE WOODS, will now be collected into big 240 page books! For everyone who hasn’t had the chance to pick up our 9 book series until now will be able to get their hands on these new editions next year starting with Yearbook 1 that collects the first 12 issues of the series. We will have 3 yearbooks in total, representing the 3 years of the Bay Point students lives in the titular Woods, all of them will come out next year, starting with book 1 in May, book 2 in August and book 3 in late 2019! Preorders are already open for the first 2 on book sites like Amazon and Book Depository. Check out my new covers specially made for these editions below! A Midwestern high school is transported into the middle of an alien forest. This is the story of what happens next. This October 10th (on my Birthday! ), the Michelangelo Macro series one-shot that I'm currently drawing and colouring will be released! I'm super honoured to come back and play with my favorite Turtle, Mikey! Below you'll be able to read the synopsis from IDW's October solicitations. Make sure to get your order in this month at your Local Comic Shop using order code AUG180742. 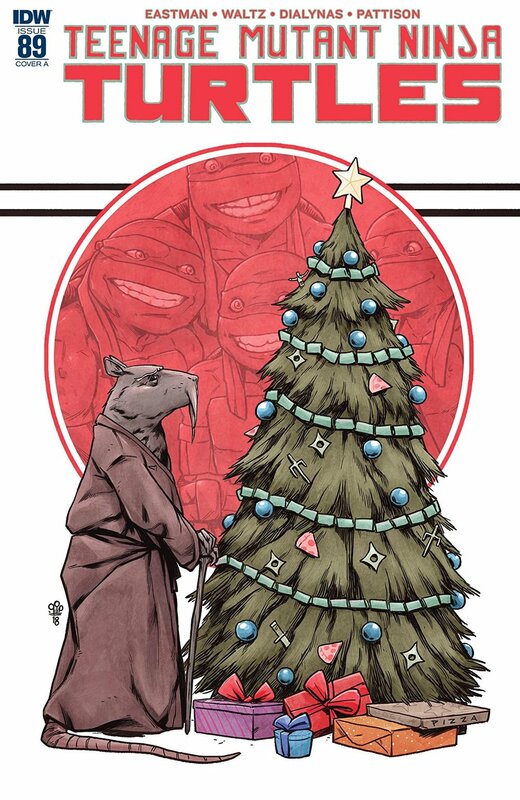 Michelangelo’s deteriorating relationship with his father, Splinter, reaches a point of no return! Will Mikey fight those he loves to save those who need him the most? An oversized special focused on Michelangelo that will have lasting repercussions for the character! 10 copy Incentive cover by Ryan Brown. I'm so happy to say that THE WOODS is nominated again for a GLAAD Media Award for Outstanding Comic Book! This means a lot now that the series ended last year with its 36th issue and to be included once again among so many awesome titles. If you want to preorder my new series with Max Bemis and give it a shot, the final cutoff for preorders is on Monday! So get your orders in to your local comic shop! I'll posting more about Lucy and her trans-dimensional adventures as we come closer to it release date next month! Max gave an interview about writing the series at Comicon.com. I'm super proud to announce that the next series I'll be illustrating is with my new co-creator, Max Bemis. Max Bemis carries an ever-lit candle for underdogs finding their identities. That mission has held true throughout his career as frontman for pop-punk institution Say Anything, and more recently as an inventive comic scribe with a growing library. Bemis poked endearing fun at aging escapists in Oh, Killstrike, which saw a timid new father come to terms with his responsibilities through the excessive filter of ‘90s extreme comics. Worst X-Man Ever continued that focus on self-realization, starring an un-merry mutant with an admittedly awful power—he can blow himself up…once—learning to embrace his internal homo superior. Bemis is currently applying his subtle characterization to Moon Knight with artist Jacen Burrows, but he’ll introduce another nocturnal adventurer come March with Lucy Dreaming. A five-issue miniseries courtesy BOOM! Studios with The Woods artist Michael Dialynas, the comic is a “sweeping, bildungsroman about living your dreams—literally.” The titular character is a grade-school dreamer of every definition, transcending her mundane surroundings every night for a series of grand excursions. The premise sounds rich, allowing the creators to address any genre with ample room for humor—the cover hints at Star Wars-by-Moebius sci-fi, and watching Bemis and Dialynas tackle the unrestrained imagination of an adolescent should be a joy. Dialynas is also handling coloring duties, layering in otherworldly gradients and vivid hues to mark the contrast between dreary reality and slumbering excitement. We’ll have more on this miniseries come March, but check out the cover to the first issue below and the Press Release. BOOM! Studios is pleased to announce LUCY DREAMING, a new limited series debuting March 2018 from Say Anything frontman Max Bemis (Moon Knight, Polarity) and GLAAD Award-winning artist Michael Dialynas (The Woods, Teenage Mutant Ninja Turtles) about a young girl who goes to sleep every night and becomes the hero of all of her favorite stories, living out grand adventures and learning more about the reality she lives in than she could ever learn in her waking life. Lucy is a grumpy, emotive, full-of-life, 13-year-old girl who keeps waking up in the shoes of various archetypal female heroes. One night she’ll wake up as a space princess turned rebel leader, another night she’ll be a reluctant heroine who becomes the symbolic motivation for an entire country to revolt. But as fantastic as these “dreams” are, they carry the same life-and-death stakes as if Lucy was awake in real life. The reason why all this is happening to her, though, is a secret for now. BOOM! Studios published Bemis’ first original comics work, Polarity, in 2013, followed by Evil Empire and Oh, Killstrike. With artist Michael Dialynas, the publisher recently published the conclusion to his award-winning, long-running series, The Woods, with writer James Tynion IV. LUCY DREAMING #1 will have a cover illustrated by interior artist Michael Dialynas. Print copies will be available for sale March 2018 at local comic book shops (usecomicshoplocator.com to find the nearest one) or at the BOOM! Studios webstore. Digital copies can be purchased from content providers like comiXology, iBooks, Google Play, and the BOOM! Studios app. "Over the past few years, Max has proven himself to be one of the most exciting new voices in comics, with the writing chops to back it up," said Eric Harburn, Editor, BOOM! Studios. "Brought to life by Mike's immense, emotive talents, LUCY DREAMING is fun, dark, aspirational, and thought-provoking." LUCY DREAMING is the latest release from BOOM! Studios’ eponymous imprint, home to a world-class group of licensed comic book series and ambitious original series, including Mighty Morphin Power Rangers, WWE, Big Trouble in Little China,Victor LaValle’s Destroyer, Mech Cadet Yu, Grass Kings, and Klaus. For continuing news on LUCY DREAMING and more from BOOM! Studios, stay tuned to www.boom-studios.com and follow @boomstudios on Twitter. As some may have realised, it's that time of the year again and New York Comic Con will take up a chunk of energy, mana and spirit broth saved for a rainy day. I'm heading over to NYC for my annual trip to have fun, see bars and chat with awesome people. In between doing touristy stuff I'll be doing two pre-con store signings. The first one and my 4th year visiting cause they are awesome and one of my favorite comic stores in the world, is 4TH WORLD COMICS this Saturday, the 30th of September. I'll be there with my traveling buddys Ilias Kyriazis and Guillermo Ortego from 12-4pm! I really love that place and getting to visit Long Island is a nice treat before the storm. THEN on Wednesday, the 4th of October, the day before the con. We'll be doing a big Annual In-Store Jam Signing at FORBIDDEN PLANET NYC from 7pm! I'll be there with the awesome talents of James Tynion IV, Eryk Donovan and meeting Alan Robert and Clay Mcleod Chapman. As for the con itself, this year I won't have a table in the Artist Alley BUT I will be hanging nearly all day at Boom! Studios booth signing and talking about WOODS stuff. I'll be there all 4 days except for the following hours. 6:00 - 7:00 - TMNT JAM signing! at the IDW booth. 1:30 - 2:30 - ROBOTECH signing where I'll be signing the 3rd printing exclusive cover that will come out that week. At the TITAN comic booth. 4:30 - 5:20 - Official THE WOODS signing at the BOOM! booth. 5:00 - 6:00 - TMNT JAM signing! at the IDW booth. The Final covers are upon us! Below you can see the covers for issues 33-35 all connecting into one big poster! And the final issues cover. The one that ends it all. BOOM! Studios and GLAAD honored writer James Tynion IV and artist Michael Dialynas' original comic book series THE WOODS in Los Angeles last Friday as the winner of the 2017 GLAAD Media Award for Outstanding Comic Book. The announcement was first made at the 28th Annual GLAAD Media Awards ceremony on April 1st. The GLAAD Media Awards recognize and honor media for their fair, accurate and inclusive representations of the lesbian, gay, bisexual, transgender, and queer (LGBTQ) community and the issues that affect their lives. The Awards also fund GLAAD's work to amplify stories from the LGBTQ community that build support for equality. The Outstanding Comic Book award was officially presented to James Tynion IV, representing the series’ creative team, at the BOOM! Studios office in Los Angeles. "Honestly, this award means the world,” says Tynion IV. “When I was reading comics in high school, it felt like I couldn't find any stories that represented my life or my struggles. I was a young man, looking to fiction to find a path for myself and queerness was always just subtext, punchline, or fleeting. I made a promise to myself then that when I become a comic book writer, I wouldn't do that. I would put the queer characters up front and center with the rest. Not necessarily to tell stories about their queerness, but to show that I existed as a part of the same world as my straight peers. To make sure that the high school James of today can find stories that speak to him on the comic shelf. "To win this award for the series that I believe is the purest expression of myself is one of the greatest honors of my young life." "This award means everything to me and I'm very honored to have our colorful space adventure recognized among the other amazing and high-caliber titles in the Outstanding Comic Book category," adds Dialynas. James Tynion IV recieving the award at the BOOM! Studios office in LA. Debuting in 2014, The Woods follows the journey of 437 students, 52 teachers, and 24 additional staff from Bay Point Preparatory High School in suburban Milwaukee, WI who vanished without a trace. Countless light years away, far outside the bounds of the charted universe, 513 people find themselves in the middle of an ancient, primordial wilderness. Where are they? Why are they there? The answers will prove stranger than anyone could possibly imagine. The series wraps up its ambitious three-year storyline in full this October with the release of The Woods #36. The series has consistently received critical acclaim for its diverse representation of LGBTQ youth among its core lead characters—including Ben, Isaac, Sander, and Sanani—and an equally vibrant supporting cast. The Woods is in development with Universal Cable Productions at the Syfy Network as an hour-long drama with Michael Armbruster writing the pilot and Executive Producing. Brad Peyton (San Andreas) is set to direct and Executive Produce, alongside his producing partner Jeff Fierson, Ross Richie (BOOM! Studios Founder & CEO), and Stephen Christy (BOOM! Studios President of Development), with Josh Levy (BOOM! Studios, Senior Vice President, Television) as Co-Executive Producer. THE WOODS WINS GLAAD MEDIA AWARD! Really happy to announce that our comic THE WOODS got the GLAAD Award for Outstanding Comic this year!!! “The Woods,” the BOOM! Studios series by James Tynion IV and Michael Dialynas, has won the 2017 GLAAD Media Award for Outstanding Comic. Presented Saturday during a ceremony held in Los Angeles, the awards honor outstanding portrayals of the gay, lesbian, bisexual and transgender communities. Debuting in 2014, “The Woods” is a sci-fi drama about an entire high school — 37 students, 52 teachers and 24 staff members — that vanishes from suburban Milwaukee, Wisconsin, only to reappear light years away at the edge of an ancient, primordial wilderness filled with dangers at every turn. The publisher’s bestselling comic of 2014, “The Woods” was optioned for television in 2015. This marks the first GLAAD Media Award nomination and the first win for “The Woods.” The BOOM! Studios series “Lumberjanes” won the award in 2016. Out this Wednesday is the 31st issue of THE WOODS. This is the first time I thought that we should change the cover from the one that was solicited a few months back cause this one feels like a better depiction of whats going on in this issue. So this week you wont find Ben tripping out but Sanami looking at photos of her classmates with little Isaac's running around instead. I think it might be the only cover that's not on our alien world or that has Alien Purple and Space Greens on it. Here's the previously announced cover with our hunter Ben Stone tripping on Gazer Root. THE WOODS solicitations for May 2017. This month you can head to your Local Comic Shop and preorder with issue 32 of the series OR Advance preorder the 7th volume called The Black City, that'll be out this July! Karen is anxious to end Isaac’s plan, but first they must team up with an unlikely ally. Written by The New York Times best-selling author James Tynion IV (Detective Comics) and illustrated by Michael Dialynas (Teenage Mutant Ninja Turtles), “The Black City” collects the seventh arc of the best-selling series, now in development at Syfy. Is there a reason mankind has always feared the untamed forest? Karen, Sanami, and Ben will have to venture far beyond the reaches of the civilization they’ve built and into the heart of the alien wilderness in the hopes of finally going home. But in the center of the woods, they discover the truth behind the ancient fear of the forest for themselves. THE WOODS in development at Syfy channel! I forgot to post this in December, so here it is! THE WOODS is currently in development at the Syfy channel with Brad Peyton set to direct and produce the series. Written by Michael Armbruster based on the comic by James Tynion IV and illustrator Michael Dialynas, the thriller is a co-production between Boom! Studios and Peyton’s ASAP Entertainment. It is set in Wisconsin where an entire high school campus — including the 300 students, teachers, parents and workers who happened to be there at the time – vanishes without a trace and reappears in the middle of the thick woods on the moon of a distant planet. Now their normal lives have suddenly and dramatically changed as they must survive the eerie and dangerous environment while desperately trying to find a way to get back home. In addition to directing, Peyton will executive produce alongside his producing partner, Jeff Fierson. Also executive producing are Armbruster and Boom!’s Ross Richie and Stephen Christy. Josh Levy from Boom! will co-executive produce. Universal Cable Productions, where the project was set up a year ago, is the studio. “We’ve always seen this title as having the potential to be a stand-out sci-fi property, and there’s no better team to do that with than with Boom! and the teams at UCP/Syfy,” said Peyton and Fierson. The Woods, currently on Issue 27 of a planned 36-issue run, is one of the longest-running series for Boom! The comic recently was named a 2016 Best Graphic Novel for Young Adults by YALSA. This is Boom! Studios’ second collaboration with Peyton, who also is attached to direct their Malignant Man feature at 20th Century Fox, based on James Wan’s graphic novel. ASAP Entertainment, which is behind the upcoming New Line/Warner Bros feature film Rampage starring Dwayne Johnson, also has drama First Responders in development at NBC with Vin Diesel producing, and their Netflix series, Frontier starring Jason Momoa, launches in January. Peyton is repped by CAA and Peikoff Mahan. Armbruster is repped by Kaplan/Perrone, Gersh and attorney Mark Temple. Boom! is in production in South Africa on The Empty Man, a supernatural thriller that is the first feature film to come out of the publisher’s first-look pact at 20th Century Fox. In television, Boom! — which has a first-look deal with 20th TV — recently sold drama Hacktivist to the CW with Matt Corman and Chris Ord writing and Alyssa Milano producing and has Butterfly in development at Channel 4 in the UK with Arash Amel writing and Cow Boy at DreamWorks Animation TV. Had some time off after finishing my issue of TMNT UNIVERSE and Volume 7 of THE WOODS lately and before i got back into working the next issue, I thought i might loosen up and try something new with a cyberpunk Ronin character. I had fun drawing this guy so i might do more of these characters in my breaks. So here's the Heavy Metal Sword Master, Gonyosoma aka RATSNAKE. THE WOODS tome 2 out next month from Ankama Editions! The second double-sized French edition of THE WOODS drops next month from Ankama Editions! I love the way these Hardcover editions look and this time the awesome Jeff Stokely's inks dazzle up the cover! THE WOODS tome 2 contains issues 9-16. THE WOODS solicitations for September and October 2016. You can get the regular wraparound cover or the Jenny Frison Incentive variant cover. Synopsis: The final year of The Woods begins here, as our crew comes to terms with the fallout from the destruction of Bay Point. I'm super excited to see these when they come out! Synopsis: The war between The Horde and New London claims more lives as Isaac goes deeper into the Black City. Synopsis: Over a year has passed since Bay Point Preparatory High School found themselves countless light years away in the middle of an ancient, primordial wilderness. Now the crew finds themselves divided, choosing sides in a war that has been raging for hundreds of years. “The Horde” collects the fifth arc of the best-selling series, issues #17-20. THE WOODS #24: END OF YEAR 2! Sacrifices will be made, and not everyone will live to see tomorrow. Woke up this morning with my face covered in dry blood. I recalled a dream of giant pouncing lions in space, it may have been because I was watching Voltron Legendary Defender last night. Then i suddenly remembered, my cat Oliver stepping on my face while i was dreaming and just left me there bleeding into my pillow in the high temperatures of our first heat wave of the year.